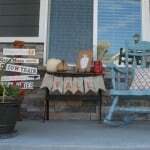 I am so excited to share with all you my Fall Porch Reveal! One of my favorite parts of our new house is the fun porch and I have been more than excited to decorate it! As soon as school started and life got back into a normal routine, I totally jumped all over it! One major bonus that came out of our moving to Northern Utah was the fact that I now have a Hobby Lobby to shop at! 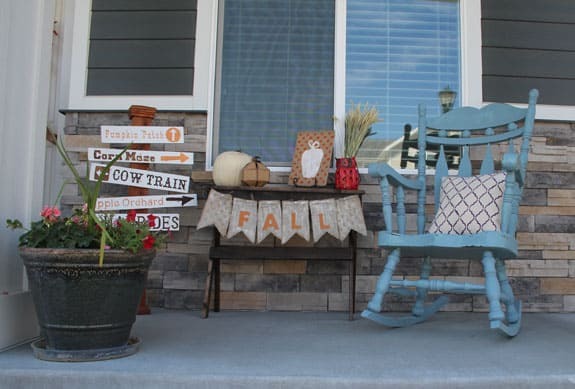 So, when it was time to figure out what I wanted to do for my Fall Porch the first place I went was our local Hobby Lobby! 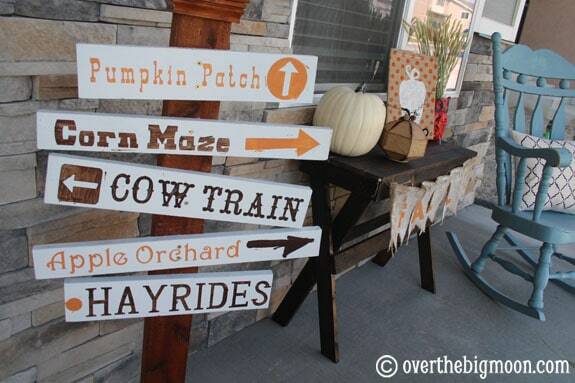 They had an isle organized with all their amazing Tulip for Your Home products and thought how fun it would be to add some stenciling projects to the porch! A few months ago I found this awesome rocking chair on a local online yard sale site for only $30 – SCORE! 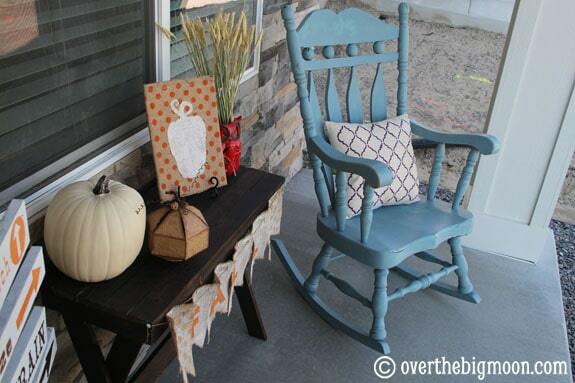 I knew I wanted to use it to add some color to the porch, so it got a paint job! I wanted to give the color some dimension, I painted it two different blue colors. 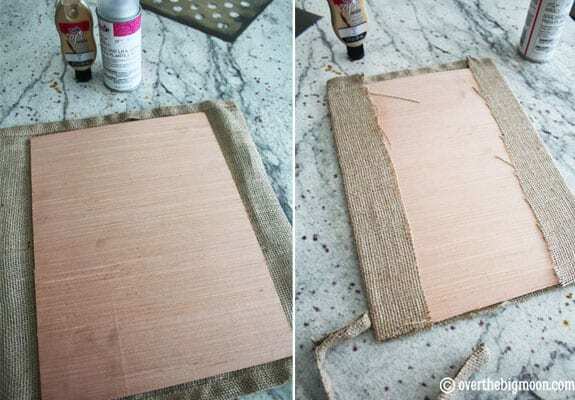 I didn’t bother making sure I got perfect coverage on either coats, because I knew I was going to do some sanding and wanted a lot of layers to show through. To finish it I sprayed it with a Polyurethane. 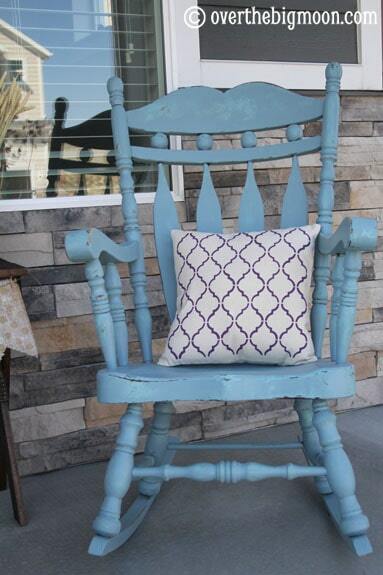 And, although the chair was cute by itself, I knew I wanted to use one of my new Tulip for Your Home stencils to make a cute pillow to put on it! 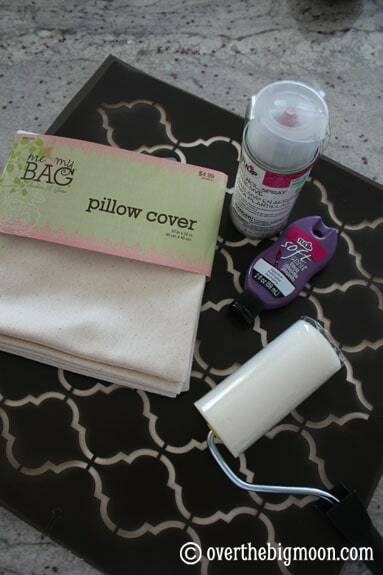 I wanted to make it more cozy looking, so I found a fun canvas pillow cover and stenciled a fun 14×14 pattern on it. I think it turned out so fun and it literally took me 5 minutes to do! Now that’s my kind of project! 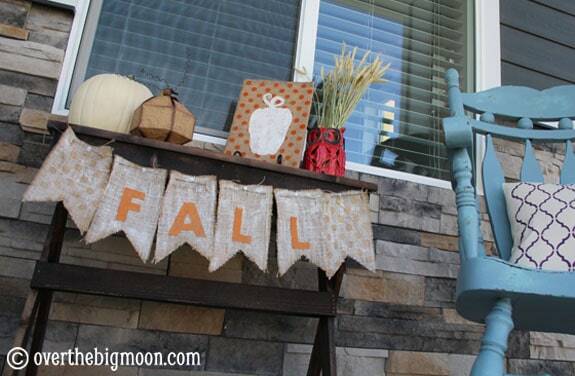 We also built a simple front porch table (tutorial coming soon), that I could decorate for each season/holiday. I wanted to put some type of taller decoration on it, but I didn’t want anything breakable. We can get some gusty winds where I live. So, I decided to make my own decorative board. 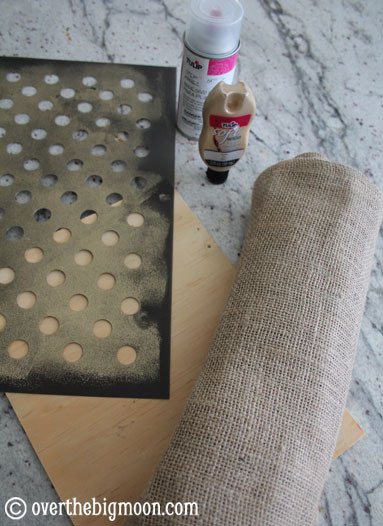 I used the Spray Adhesive to attach the burlap to the board! It worked SO good! I wanted it to have a rougher look, so I didn’t fold the top and bottom over. I just left the top that way it was and cut the bottom off. 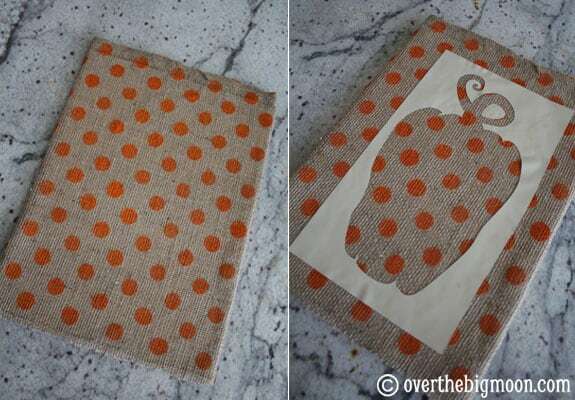 I then used my Tulip 14×14 Stencil and Orange Fabric Paint to put some fun Polka Dots on the burlap! After that dried, I used my Cricut to cut myself a pumpkin stencil and used Brown Fabric Paint to paint that on! 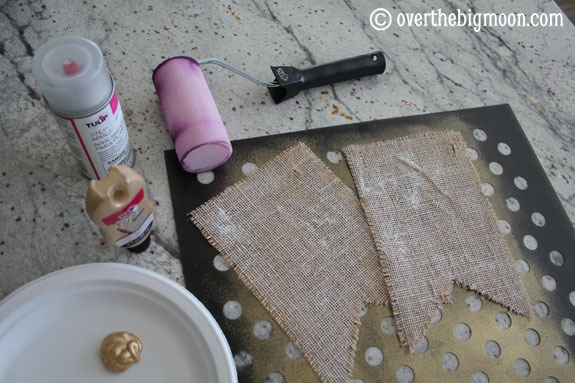 For the front of the table I had already put together this White Washed Burlap Bunting. 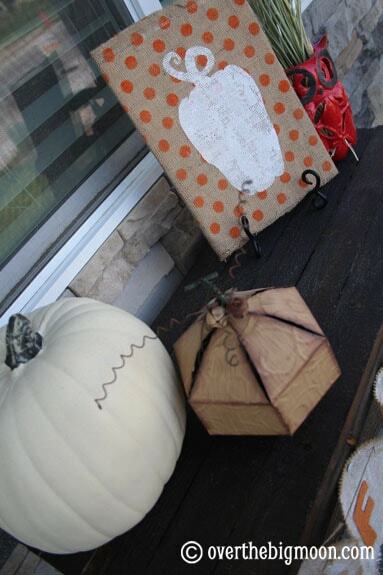 But, after putting together the rest of the decorations I wanted it to be cohesive with the Pumpkin Board I made. So, I took the plain flags and stenciled the Polka Dots on them as well! 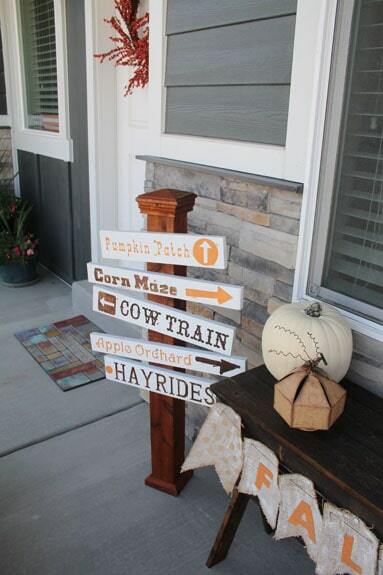 For the last project I knew I wanted to add some signage to the front porch, so I built this fun directory sign. Is that what they are even called? I’m not even sure, but that’s what I’ve been referring to it as. There is a full tutorial coming soon, but seriously guys, how fun did this turn out? I am so beyond happy with it! I am so happy with how my porch turned out! 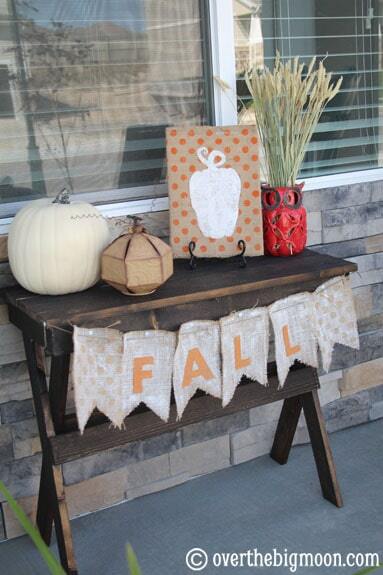 The stenciling added so much and was so affordable! Be sure and check out I love to Create (Tulip) on Facebook, Twitter and Pinterest! This is darling! I’m so in love with all of it!! Thanks so much Amy! Didn’t you love the Tulip Fabric Paint? It’s the best! awesome projects. Where did you get the pillow covers? The pillow covers are from Hobby Lobby! Only $5!! Thanks Vanessa! You’re too sweet! Thanks Gail! Appreciate your comment!